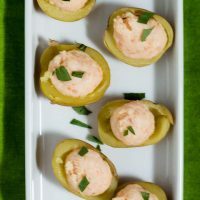 Celebrate St. Patrick’s Day with smoked salmon stuffed baby potatoes. 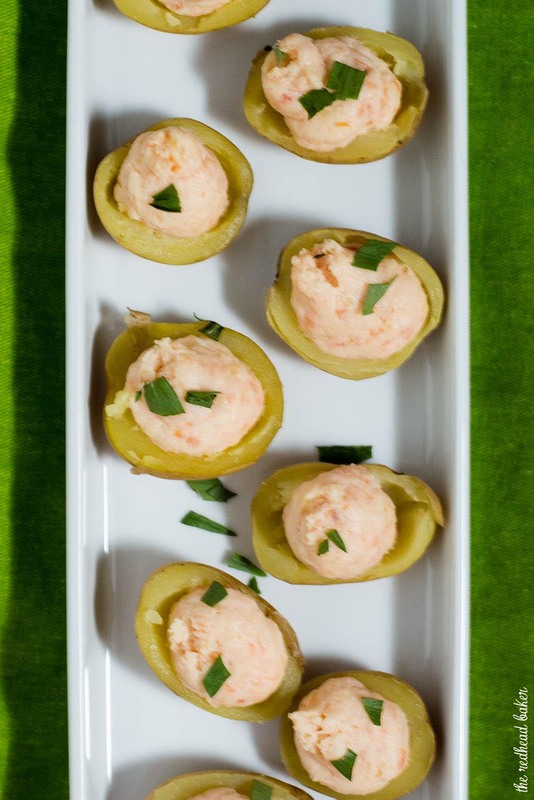 These appetizers are little pots of gold stuffed with delicious filling! Welcome to our monthly Progressive Eats dinner! This month’s theme is Green or Irish-Inspired dishes, and our host is Liz of That Skinny Chick Can Bake. Being at least part Irish myself, I was really excited about this month’s theme. In the past, I’ve made Irish oatmeal bread, and Irish soda bread scones, so for this progressive dinner, I decided to contribute an appetizer. I knew I had to incorporate potatoes somehow, after all, what’s more Irish than potatoes?! I settled on stuffed potatoes, because they are easy, and depending on the filling, can be served warm, room temperature or cold. These particular potatoes are best served room temperature or cold. 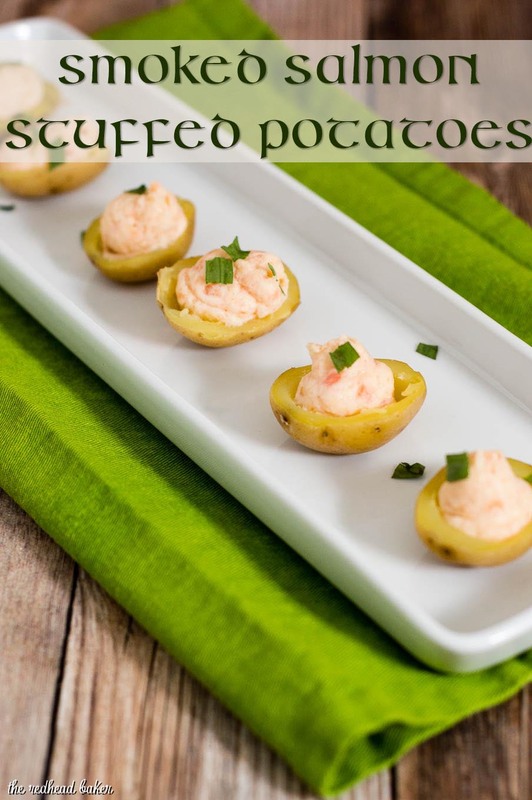 I settled on a filling flavored with smoked salmon, because although seafood is not eaten as often as in other island countries, salmon is one of the more common fish consumed. I chose baby Dutch yellow potatoes because after boiling, the inner flesh becomes buttery and creamy, without having to add butter or cream! 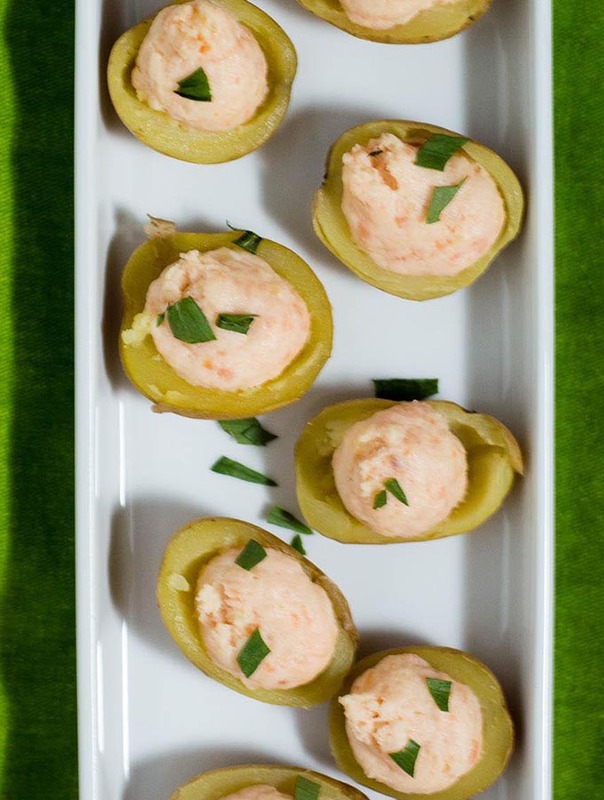 This filling is combined with the smoked salmon, cream cheese and sour cream. Mustard and tarragon add extra flavor. These are addictive little bites that are delicious chilled or served at room temperature. 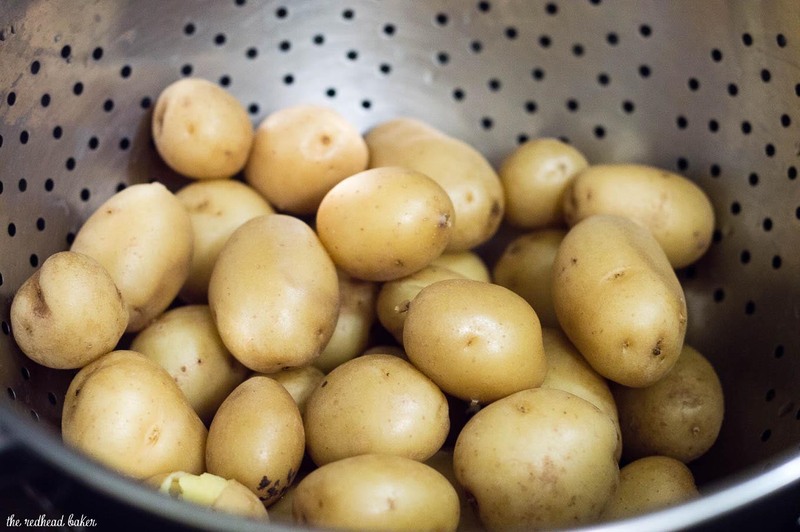 The number of baby potatoes in a pound will vary depending on the size of the potatoes, so the filling can easily be scaled up or down as needed. Or just double it and serve any remaining filling on buttery crackers for a nice contrasting crunch to the creamy filling. Place the potatoes in a large pot. Cover with cold water that comes up 1 inch over the tops of the potatoes. Season the water generously with kosher salt. Place the pot over high heat and bring the water to a boil. Boil the potatoes for 10 minutes, then drain. 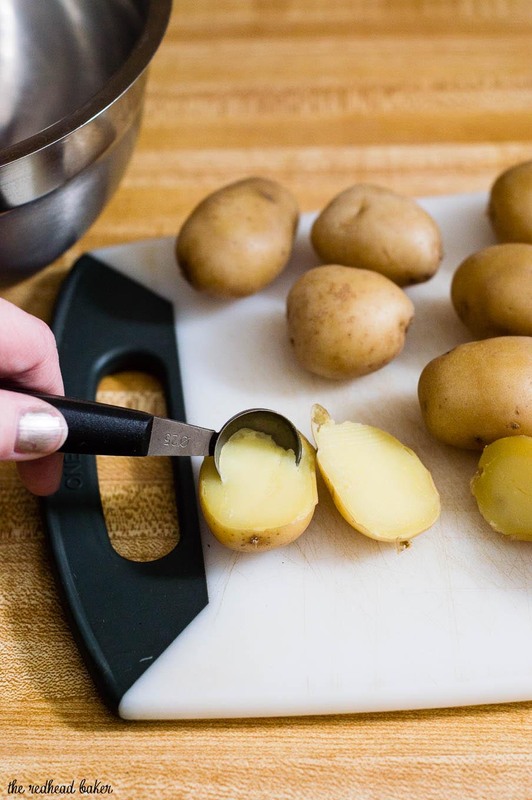 Once the potatoes are cool enough to touch, slice them in half. Use a melon baller or small spoon to scoop out the flesh from each half, leaving a 1/4-inch around the edges. Place the scooped out flesh in the bowl of a food processor. Set the potato halves aside to cool completely. Add the smoked salmon, cream cheese, 2 tbsp sour cream, Dijon mustard, and 1 tsp chopped tarragon to the food processor. Pulse until combined. If the mixture seems dry, add another tablespoonful or two of sour cream and pulse until mixed. The mixture should be soft and creamy. Scrape the mixture into a piping bag or heavy-duty plastic zip-top bag. Snip off one corner, and pipe the mixture into each potato half. Garnish with more chopped tarragon and serve (or store in an airtight container in the refrigerator until ready to serve). Welcome to Progressive Eats, our virtual version of a Progressive Dinner Party. This month we’re sharing Irish or Green recipes in anticipation of St. Patrick’s Day You’ll certainly find a delicious recipe to add to your repertoire! Our event is hosted by Liz who blogs at That Skinny Chick Can Bake. We have a full menu of dishes including appetizers, sides, an entree and desserts. You’ll certainly find a delicious recipe to add to your holiday table! If you’re unfamiliar with the concept, a progressive dinner involves going from house to house, enjoying a different course at each location. With Progressive Eats, a theme is chosen each month, members share recipes suitable for a delicious meal or party, and you can hop from blog to blog to check them out. Such a scrumptious potato filling! Plus a fabulous presentation!!!! That is a cool presentation and I love the whole combo! These sound fantastic…I could honestly make them my whole meal! I love this – I could make this a main meal !!! Great idea!! I love sharing the "why" behind the "how," so that home bakers of all skill levels can be comfortable making my recipes. Read more about me. Get new recipes delivered to your inbox at a frequency that works for you!